One of the things we are trying to deal here on DIYP is making ring lights without going into all the mess and (possible) danger that goes into wiring and sawing. Till now, we’ve were only half there with some IKEA based rigs that provided some nice bulb support, but we never made it all the way through to a really each hack. Videographer Joel Loukus came up with the missing link. 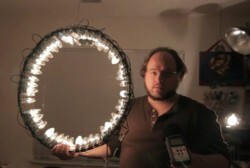 By using multiple Christmas lights around a wire frame he built The WreathLight. A Christmas Lights based ring light. (Dont miss out on the chi-ching sound, it really makes the light quality that much better). One small but important tip from the video is to try and use the clear bulbs as they output more light don’t get as hot. Maybe two hulahoprings, two special cramps and a line of Christmas Lights can do the trick.